The Sports Archives – That’s a Record Home Run! 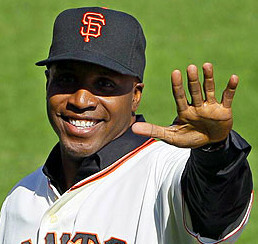 Barry Bonds, retired left-fielder of Major-League Baseball, holds the record for most home runs hit in a single career to this day. Most baseball enthusiasts are quite familiar with the tumultuous roar of excitement that accompanies a home run. In baseball, a home run is officially categorized as any successful hit made by a batter that (provided the defense commits no errors) allows said batter to round the 3 bases on the field and home plate, all in one single play. Most commonly, a home run is executed by striking the ball with enough power to send it beyond the confines of the playing field – after all, a player cannot be tagged “out” if the ball cannot be physically retrieved to complete a play! Despite being much more rare (especially in the more professional leagues) “Inside-the-park” home runs also exist, and are usually achieved via lucky hits that reach almost as far into the outfield as standard home runs (and/or if the batter is a speedy baserunner). Surprise home runs can come to be known as the “turning point” to a game, especially if the scoring team has been performing badly. The shock and entertainment value of home runs can shake even the most stalwart defense and invigorate fans in a short period of time, bringing life back to a game that may have been losing pace. Because of this, it is easy to see why home runs are so iconic and appreciable. Babe Ruth was the “founding member” of the 500-Home Run Club, and hit a total of 714 home runs over the course of his career. He was a true American hero of the 1920’s and remains an inspirational figure in baseball for decades to come. Hitting a home run is a daunting task to the average baseball player. Even professionals, most of the time, aim to simply make contact with the pitch and score a base hit. Other players have the power and coordination that makes cracking a long shot a greater possibility. Now, imagine being a professional batter and hitting over 500 home runs in a single career. Very few players achieve such a feat, and for the successful, entry into a special club of honor is permitted. This aptly- named group is called the “500 Home Run” Club. The “500 Home Run” Club is reserved for only the most renowned hitters in the history of Major-League Baseball. The first “official” member of this club is none other than George Herman Ruth, Jr., or, as he is more popularly known in baseball history, “Babe Ruth.” Ruth hit his 500th on the 11th of August, 1929, and in addition to this historic bat, managed to achieve 214 more home runs in his career. The organization has grown to include over 26 members over the history of MLB, recently acquiring its 27th, David “Big Papi” Ortiz of the Boston Red Sox, just a couple weeks ago. The 500-Home Run Club is often considered a foreshadowing promise of entry into the Baseball Hall of Fame for players that gain access to it, but although most (not all) players are elected to the Hall of Fame later in time, this is not entirely true. In fact, even the #1-ranked player for most home runs hit in a career, Barry Bonds, has yet to be considered for this honor, despite achieving over 750 home run bats between 1986 and 2007. Unfortunately, admission into the Baseball Hall of Fame is both limited and determined by election, not necessarily achievement. David “Big Papi” Ortiz, the 500-Home Run Club’s newest member as of September 25th, 2015. It is possible that the accomplishment of so many home runs for a single individual has, over time, declined in prestige. In more recent years, the hallmarks of performance and human integrity have also become tarnished by the stigma of performance-enhancing drugs and steroids. Despite controversy, however, home runs are (and shall continue) to remain one of the defining elements of success and commendation in the world of professional (and recreational) baseball. This entry was posted in Baseball, Other and tagged Baseball, Greatest Moments, MLB, sports, sports and fitness, sports and training, Sports Archives, Sports Blogs, sports history, sports performance. Bookmark the permalink.